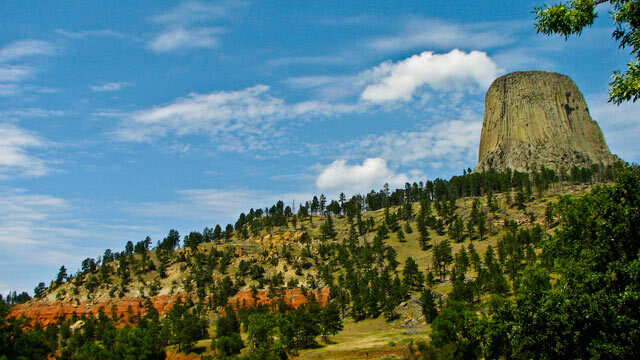 The first national monument in the U.S., Devils Tower, in northeastern Wyoming. Wyoming draws travelers for the Western culture and history it embodies. And then there are those National Parks: Yellowstone, which is home to 75 percent of the world's geysers (including Old Faithful) and Grand Teton, an ecological marvel that's home to trails and famous Snake River. (A $25 vehicle pass gets you 7-day entry to both.) But your travel plans shouldn't stop there, since a bevy of other fascinating attractions also call this state home. Here are a few. Yellowstone is the nation's very first national park. But there's another first in them 'thar hills: Devils Tower, our country's first national monument. Towering 1200 feet above Wyoming's eastern plains, it's a massive volcanic rock formation with a unique flat top. There are eight miles of natural trails, including a paved 1.5-mile loop; there are also ranger-led tours, and climbing the colossal rock is allowed year-round, except for June. You can also boat nearby Keyhole Reservoir's 14,000 acres or fish for walleye and catfish along Belle Fourche River. True, the cowboys whose lore is alive and well here did not hit the road on four wheels. But your favorite ride can take you down a bevy of scenic backcountry drives, allowing you to take in this state's boundless miles of natural beauty. Beartooth Scenic Byway, Wyoming's highest paved highway cresting at 11,000 feet, is legendary for its spectacular views. And the Bighorn Scenic Byway, which runs some 60 miles over the Big Horn Mountains, takes you through forests, meadows and canyons. While breathtaking, these drives can be desolate, so pack and plan accordingly (as in, bring a spare tire). Wyoming offers a chance to rest your head in digs that go well beyond your average hotel room. Dude ranches reign supreme here, like Paradise Guest Ranch in Buffalo, where you can book weeklong all-inclusive stays during the summer. Also, cabins can be luxurious; at Fireside Resort in Wilson, they come with deluxe kitchens, private decks, goose-down pillows and flat screen TVs. And then there's a teepee; Sands Whitewater in Jackson Hole leads 16-mile overnight whitewater treks out of Pine Bar campsite, where you sleep by the river and on cots inside brand new teepees. Natural hot springs are a big attraction in Wyoming; even warring tribes of Native Americans would soak in them side by side to take advantage of their purported healing properties. Spots like Hot Springs Park and the town of Saratoga draw steady crowds. But for more of a wilderness feel, consider a dip at Granite Hot Springs, just south of Yellowstone and Grand Teton, where a seven-foot-deep natural pool stays at a steamy 104 degrees; you can camp here in summer but need to be versed in snowshoes or skis to access it in winter. Dinosaur bones don't make for a tourist draw just anywhere. But Como Bluff, a long ridge near the town of Medicine Bow, is home to a wide variety of prehistoric remains. We're talking thousands of well-preserved dinosaur fossils dating back 100 to 200 million years. The wares at Merlin's Hide Out in Thermopolis are a throwback to a centuries-old, rustic tradition where warmth came from the hides of wild animals. Here, you can shop for an amazing array of expertly tanned pelts: buffalo, beaver, fox, skunk and badger, to name a few. There are accessories like hats, purses and blankets, too; a mounted buffalo head will cost you a little over $3,000. The infamous Butch Cassidy was among the inmates housed at Wyoming Territorial Prison in Laramie, which operated in the late 1800s and early 1900s. It's now a State Historic Site and a museum. Among the exhibits is the Broom Factory, where prison labor produced more than 700 brooms a day, which were then shipped to neighboring states and as far away as Japan. Admission is $5. Wyoming is home to several ghost towns, abandoned frontier settlements that pioneers once called home and that now offer a fascinating glimpse into Old West life. South Pass City was home to miners after gold was discovered in the mid- 1800s, and today it features several authentically restored buildings. And Piedmont was a once-thriving timber town that now is home to old home foundations and cemeteries; legend has it that Butch Cassidy buried gold somewhere in this town. Gabe Saglie is Senior Editor for Travelzoo, which features hotel, airfare and a bevy of local deals in Wyoming.